The Stiga MULTICLIP-PRO53Sb mulching lawnmower is one of the most efficient and economical models on the current market for the professional user. Powered by a briggs and strattion autochoke engine, this self propelled lawnmower comes equipped with a strong 53cm aluminium deck. It also boasts aluminium wheels with professional double ball bearings. It features a single lever height adjustment system which offers a cutting height range from 30mm to 65mm. Its handlebar can be easily adjusted to suit the users height and size. The Stiga MULTICLIP-PRO53S is ideal for the gardener who finds it difficult to dispose of their grass clippings because it is designed specifically for mulching. 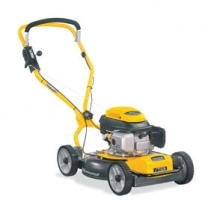 This model boasts a multiclip system which cuts and recuts the grass into tiny pieces. These, in turn, simply wilt away returning valuable nutrients to the soil, thus encouraging beautiful, green growth. It also offers the added bonus of eliminating the need to rake up the clippings or empty a collector. This means you can cut the grass about 30% faster compared to a collecting mower. Robust, durable and won't rust. An adjustable offset handle makes cutting close to walls and around obstacles very easy.